PoleAlignMax (and FocusMax, another of their very useful programs). 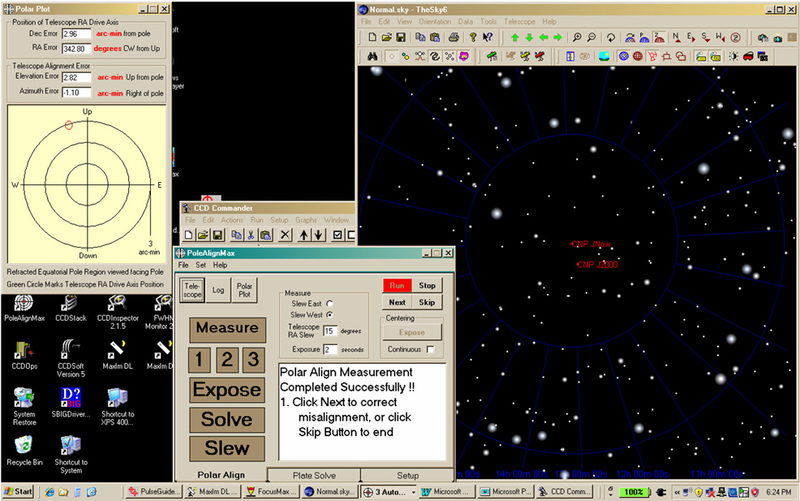 PAM helps you quiclkly and accurately align your mount to point to the Celestial North Pole (CNP) and, in addition, tells you the accuracy of your alignment. That is key. If you don't know how close you are and if you don't know if you are closer or further after the last tweak you are blundering around in the dark. found the plate solves to sometimes fail with CCDSoft and TheSky. I would recommend using Maxim with PAM if you have it. Length, Pixel Size and binning and let PAM calculate the image scale. longer baseline but remember that the longer the baseline the lower the Alt for the third exposure. I.e. each run is independent and you don't have to complete the alignment from the same starting point where you began. 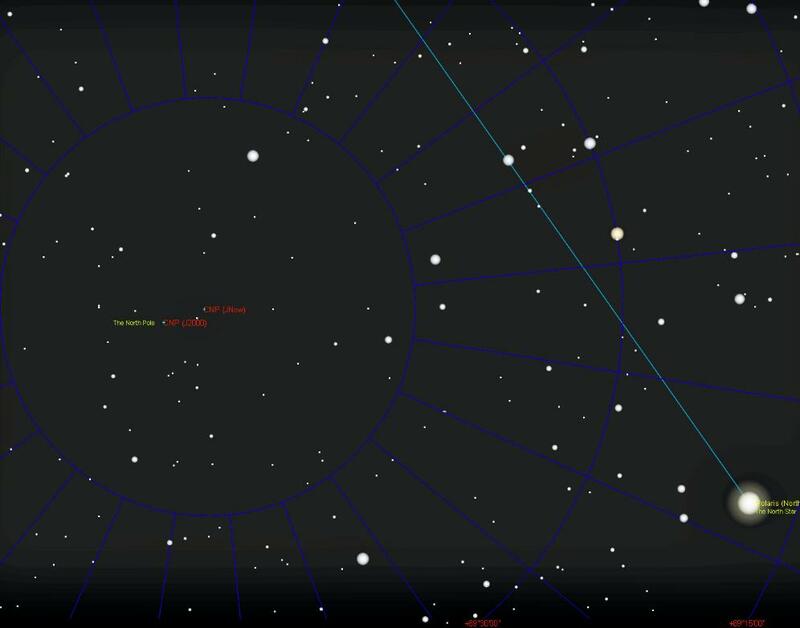 37 North and use a point a little above (closer to the pole and to Zenith) than the celestial equator. Dec +10 works well at my location. feet away (on a different slab of concrete). I sit still there for the few seconds the run takes. This seems to help reproducibility of measurements. minutes” is as accurately as you need to know this movement. correction. Then I do another run. I can do 3 or more runs in that fashion in the time it would take to do one run followed by centering with the crosshairs. find this converges quickly and is much faster than chasing errors to one side of the pole then back to the other. I usually set up in the same place and I know about where the CNP is (it’s "just to the left of that tree"). So my first run is always within a degree, usually closer. one more run or so. faster than a few precise corrections. need is a plate solve. So you are free to pick a starting point at a convenient Dec near the meridian and just start my run. future, updated version of PAM which corrects this minor discrepancy. RA 0 Hrs 0 min 0 Sec Dec North 90 deg 0 min 0 Sec. coordinates for where the CNP (Dec 0:00:00) is now. values for RA and Dec and enter those as J2000 coordinates in the User Defined Data menu as “CNP (JNow). At the moment (January 2009) CNP J(Now) is in J2000 values at about RA 00 Hrs 11 min 15s Dec +89 deg 56’ 56” and is about 3 arc min from J2000 CNP. arc min resetting the CNP(JNow) every year or two will keep you within the error of the method. the night and with the seasons. That’s where you need TheSky. 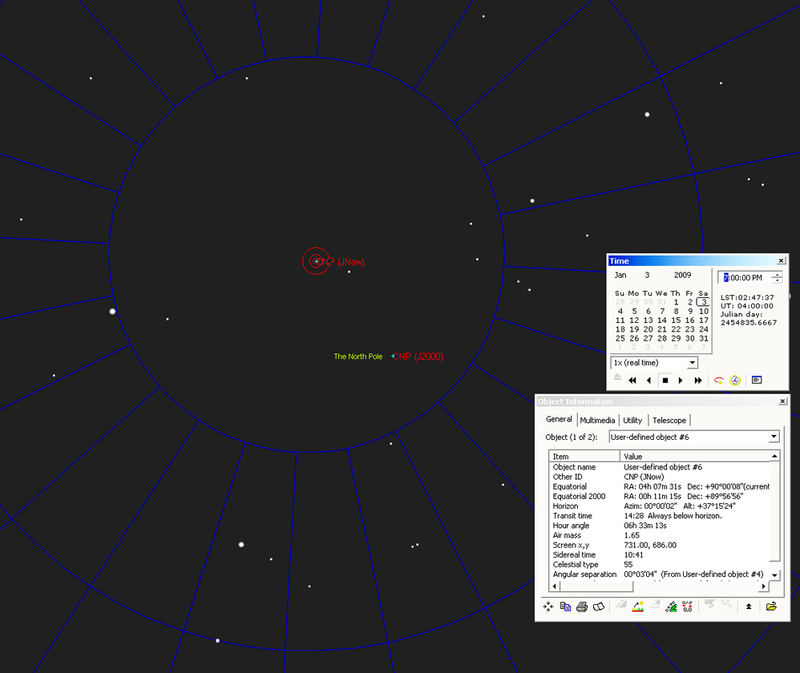 image in TheSky or you will change the orientation of CNP(JNow) to CNP(J2000). at the intersection of the RA lines where the CNP(J2000 is slightly offset. error is about 3 arc min down and slightly to the left. Don’t sweat the small stuff in direction nor magnitude. If you get in the correct quadrant you will be well within the accuracy you need. 3 arc minutes from CNP(J2000). you are within an arc min (0.5 arc min if you are compulsive) relax and start imaging.